I’m Kevin Parish, a Software and Web Developer currently based in Toowoomba, Queensland. I have recently finished my Bachelor of Information Technology, Majoring in Applied Computer Science at the University of Southern Queensland. Prior to this I also completed a Certificate III in Information Technology and a Diploma of Information Technology (Software Development) at the Gold Coast Institute of TAFE. I have always been passionate about technology and science, some of my first memories are of my grandfather’s Macintosh PC and later my first gaming console, the SEGA. Since I was young I have been interested in technology, always keeping up with the latest consoles and amassing quite a large collection. When I got through high school I saved my money and built my first PC. Family and Friends would always call on me to troubleshoot, fix, build and recommend PC’s for them. During High School, I had my first taste of programming and have been hooked ever since. In my spare time, I am usually still around computers as I am a big gamer. I love to relax by playing games with my wife and our friends. I enjoy problem solving and finding better and more efficient ways to approach problems. I am relaxed when I am programming and at ease when I am programming with my favourite languages being Java and PHP although I am proficient in many other languages. I enjoy a challenge as well as being able to utilize my knowledge and skills to not just implement a solution but to also research and learn any other modern and innovative solutions that may be available. I work well as a part of a team as my many years of customer service experience at Woolworths have taught me, however I am also very skilled at working alone. I keep myself motivated and on task under minimal supervision even supervising others and keeping them on task. I very much look forward to taking the next step and starting an exciting new career as a Software and Web Developer. Other Roles: Grocery and Perishables Replenishment, Back Dock, Night Fill, Checkouts. Experience: Customer Service, Merchandising, Inventory Management, Order Receiving, Point of Sale, Supervising Staff. Experience: Customer Service, Food Preparation, Inventory Management, Point of Sale. Windows, Linux, Android, iOS, Mac OSX. Apache Server, MySQL, Eclipse, NetBeans, Visual Studio, Notepad++, Microsoft Office, Adobe Creative Suite, Android Studio. Installing and Configuring Routers and Modems. 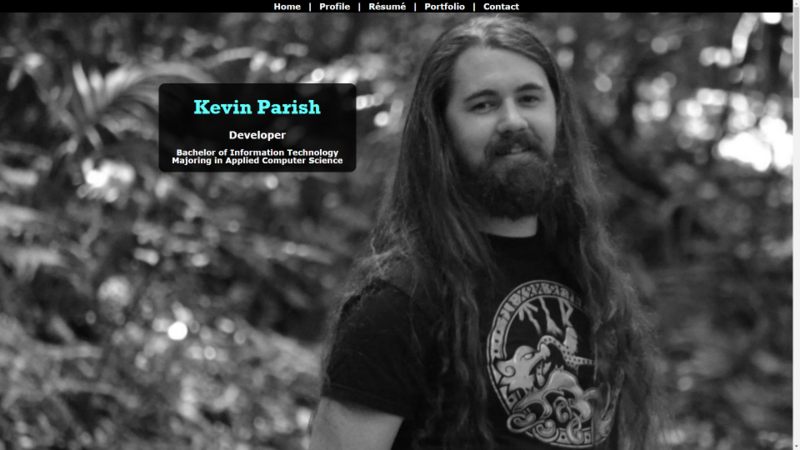 kevinparish.com is my personal website. It includes information about my education and work history as well as up to date information of projects that I am currently working on. The website uses a one page design allowing it to convey all of the necessary information on a single page, accessible via the use of scrolling and a fixed menu. The design is also made responsive with the help of CSS3 and media queries, this gives the user a great experience when using a mobile device. To keep development work organised, PHP was used to create templates for the different website sections. PHP was also used in conjunction with MySQL to provide a user the ability to send messages as a method of contact. kevinandtahnee.com is a website created to celebrate my wife and my wedding. As the ceremony was a private affair family and friends needed a way to be informed and included in the wedding. The website provides wedding details and many photos of the day. It also includes a Guestbook sections for "guests" to leave well-wishes. 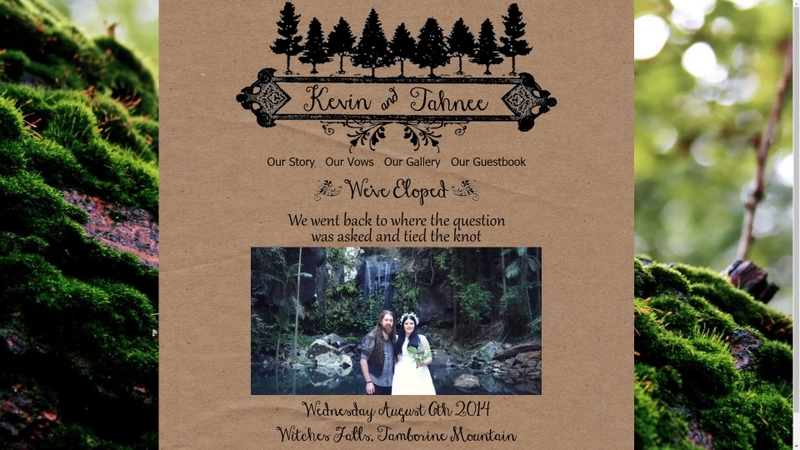 The website uses a simple rustic design to capture the theme used on our wedding day. All design work and layout was carefully chosen and approved by the client (My Wife). The design is also made responsive with the help of CSS3 and media queries, this gives the user a great experience when using a mobile device. PHP was used to create the overall website allowing the use of template sections within the development. A MySQL database was set-up providing to a way to store wedding photo file paths so that thumbnail images can be dynamically loaded on a single webpage and the corresponding photo will be loaded when selected. The database was also used to store and dynamically display well wishes left by guests. The Guestbook section had to be changed at later date to avoid malicious spam and advertisements from being entered and displayed by WebCrawler Bots. This was remedied by utilising a CAPTCHA Form when guests try to leave a message.